This is how you learn. 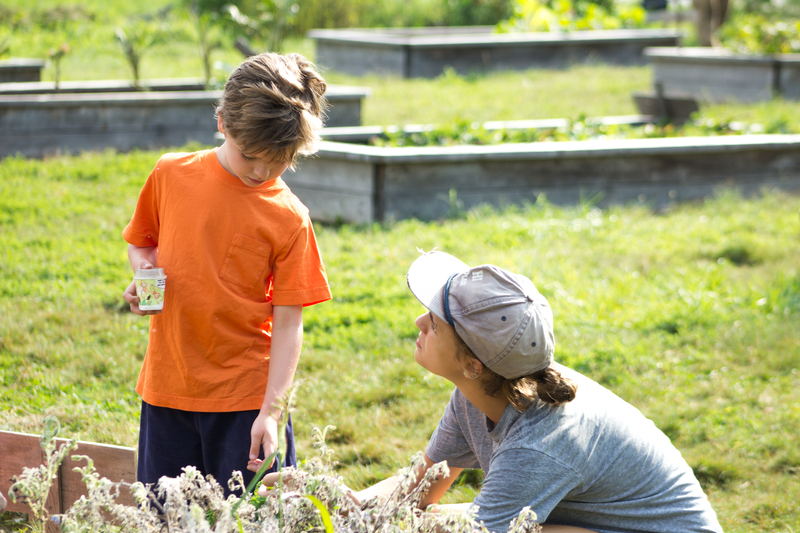 To my complete delight, she invited me to do a cooking class with the campers at Arcadia, a cool, non-profit farm – where Pamela is the Executive Director – dedicated to reconnecting us with our food and the people who produce it. 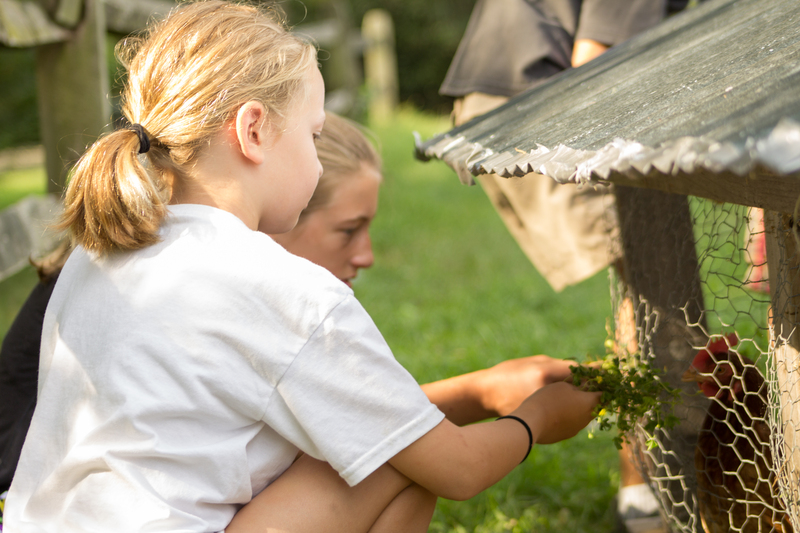 These kids have spent a week feeding chickens, pulling weeds, harvesting fresh produce and learning how to cook. 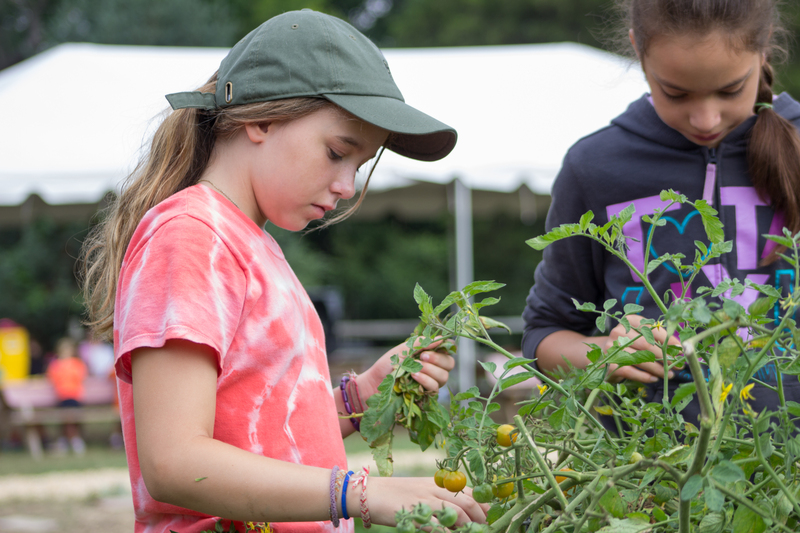 They already knew amazing recipes like zucchini pasta, fresh salsa, and veggie quesadillas. They even have mad knife skills. From the second I arrived they were all over me. “Who are you? How’d you become a chef? What are we cooking?” They uncorked bottles of vinegar and oil knowing instinctually to smell them. When they found something they loved, they immediately shared it with someone else. They asked how we were using each new ingredient and tool that I placed on the table. We cooked together for just over an hour, far longer than my childhood attention span. We made pan con tomate, and tossed vinaigrettes over zucchini and corn, and arugula, fresh from Arcadia’s farm. During Q&A one of the campers asked me how I learned to cook. I talked about the years I spent exploring and practicing in the kitchen, but they didn’t really need an answer from me. 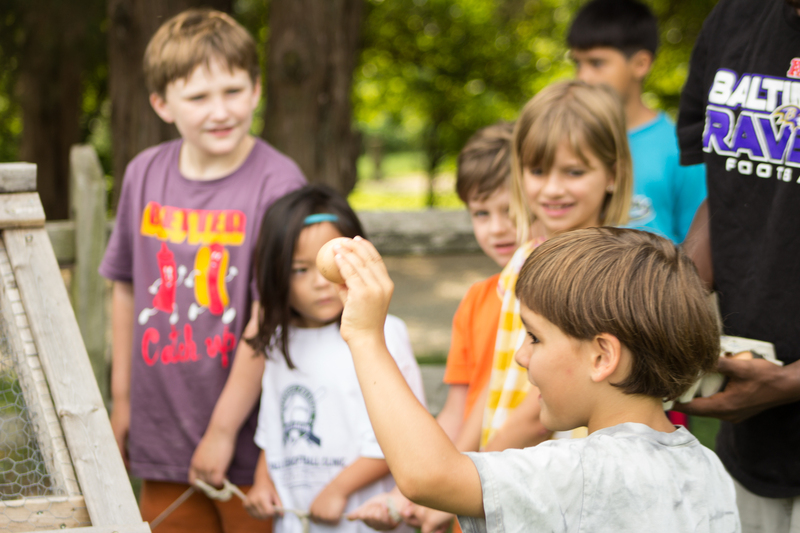 When it comes to learning, they are already experts. Olive oil – the good stuff! Warm your oven to 400 degrees and toasts the bread until crisp and golden on the edges, about 8-10 minutes. Rub toasted bread a couple of times with the clove of garlic. Cut each tomato in half and grate into pulp using a box grater. If the pulp is really watery, strain through a fine sieve to thicken. Spread a teaspoon of pulp over each baguette slice. Sprinkle with salt, drizzle with a drop or three of oil, and serve. Mix together zucchini, corn and basil in a large bowl. Chop garlic, sprinkle with coarse salt – like sea salt or Kosher salt – and mash into a paste on your cutting board using the flat side of your knife or the tines of a fork. Add the garlic to a small bowl with the vinegar and honey. Whisk together. 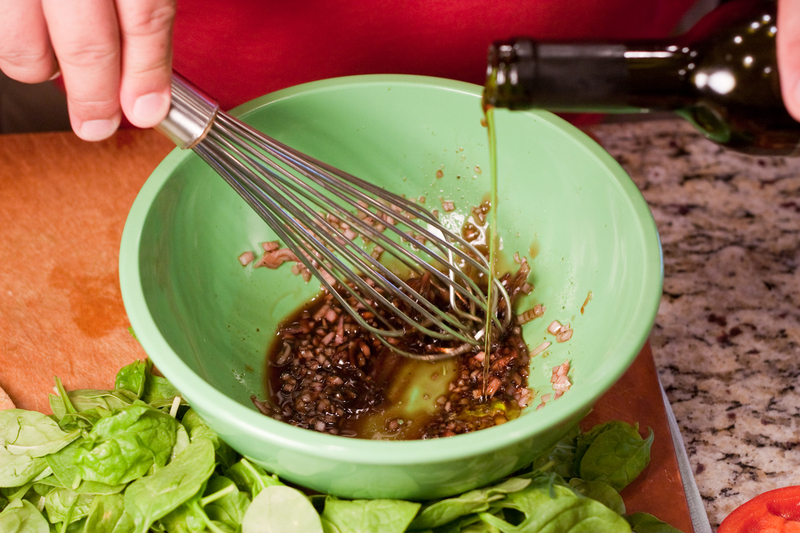 While whisking, pour the oil into the vinegar mixture, in a thin stream. Whisk until it forms a thick, creamy emulsion. Dress the veggies lightly and serve. Place the arugula in a large salad bowl. Dress the salad lightly, tossing with tongs to coat. A perfectly dressed green salad should just glisten with dressing and there should be almost nothing left in the bottom of the bowl when you’re done serving. Aside from Sylvester’s famous expletive, I thought succotash was one of those weird, dated American farm dishes where lots of unappealing vegetables were cooked down, in large batches, into an equally unappealing mush that inspired fond, parochial memories, while no one actually wanted to eat it. I was wrong. Liz Creelman Patterson and her husband Rob are responsible for my recent education. The succotash served alongside my trout at their fabulous wedding earlier this month, was delicious with firm, fresh vegetables and bright herbs. 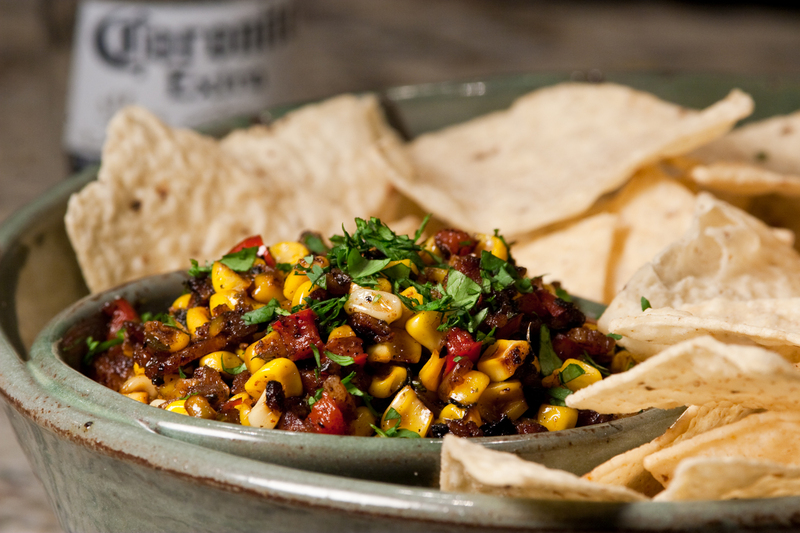 Based on a Narragansett Indian dish of corn and shell beans, succotash has spread throughout the US. 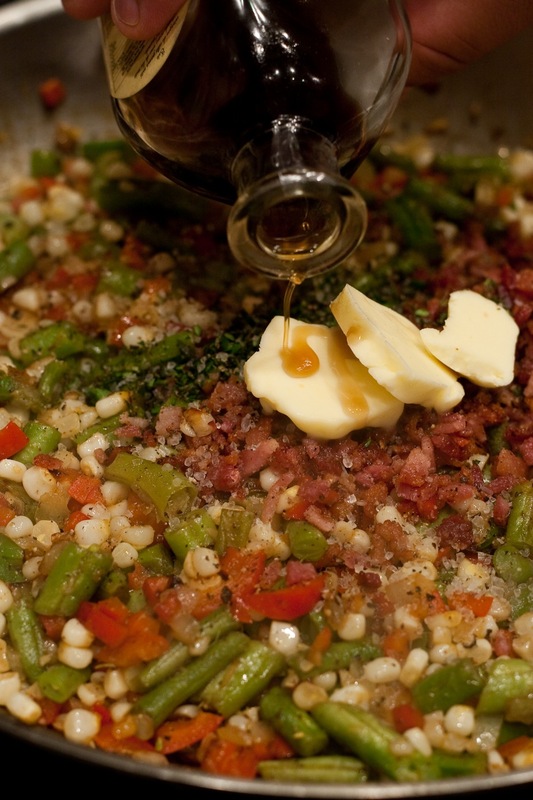 It seems best known today in the South, where okra and lima beans are cooked in lard. I used the bright green beans that were plentiful at DC’s Eastern Market (and no shelling involved), added red pepper for sweetness and color, thyme for savory depth and a pinch of piment d’espelette, a French pepper that is dried and ground with great complexity and mild heat. Bacon brought pig to the dish instead of lard. 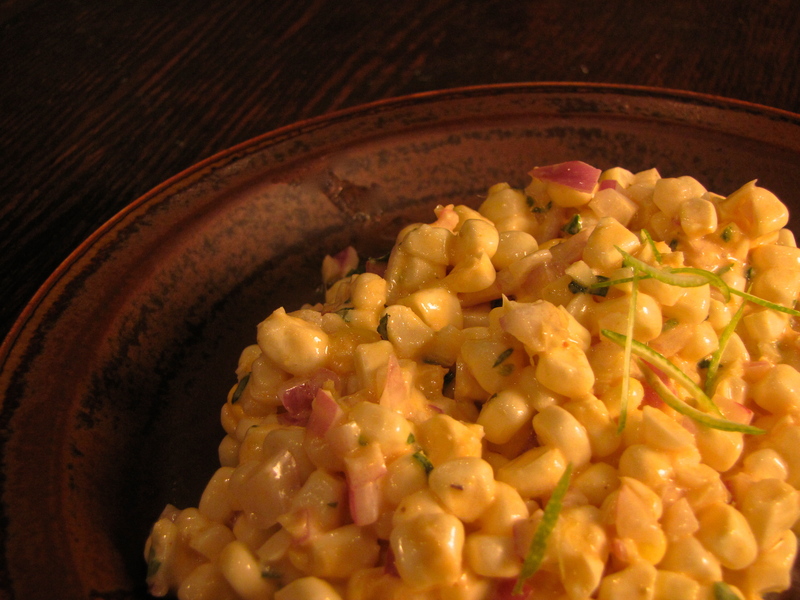 This succotash was the clear winner in our test kitchen that week. Ready in under 20 minutes, there was no sufferin’ in the preparation or the eating. Sauté bacon in a large skillet over medium heat until browned and cooked through. Remove with a slotted spoon. Add onion to skillet with bacon fat and cook until softened. Add garlic and cook 30 seconds until fragrant. Add green beans and pepper to pan and sauté for 5 minutes. Add corn, cover pan, reduce heat to medium low and cook 10-15 minutes until vegetables are crisp tender. Remove lid, add thyme and bacon, and cook an additional 3 minutes. Season to taste with salt, pepper, cayenne, butter for richness and vinegar for brightness. We grew up eating a lot of corn. A summer staple, we always ate it the way God made it – fresh from the cob. A quick roll in a stick of salted butter was the only addition. 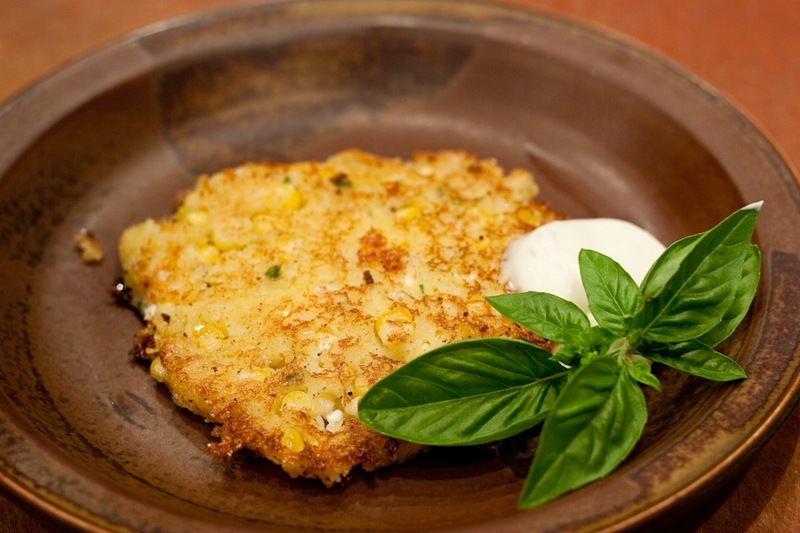 So, a little short on experience, I hatched a plan to serve corn fritters during this week’s Saturday morning Eastern Market demo. Fortunately God smiled on me just like he smiles on the corn. Now, I make a mean zucchini pancake, so I had a few of the basics down, but I was certainly ready to accept some expert advice, which arrived in the form of Art Smith, Chef/Owner of DC’s Art and Soul and a return contestant on the current season on Top Chef Masters. It was test night, and once we had nailed down the recipes for a fresh plum soup and cold peanut-sauced soba noodles, I stepped out of the way. If you have any doubts, Chef Art’s reputation as a top chef is well earned. 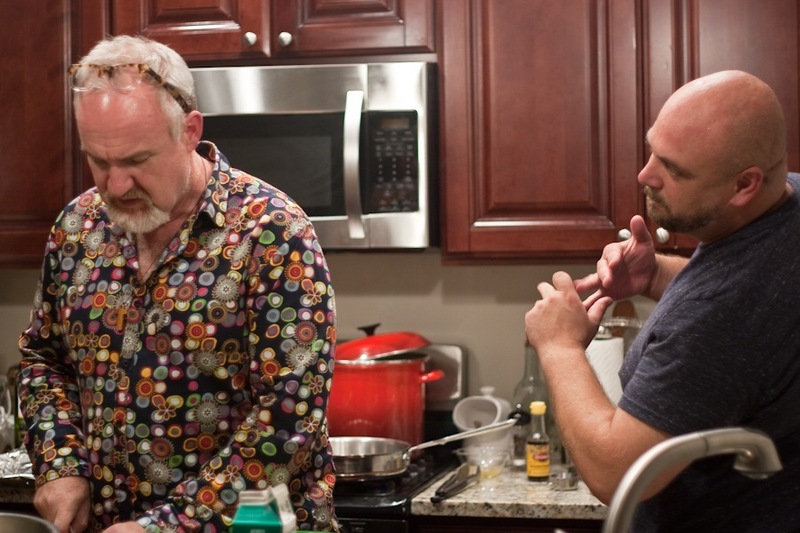 It was a wonderful experience watching him bring the recipe together, instinctively finding the right texture and flavor. After a quick test batch he settled on a slightly thick batter, lots of corn and just a couple tablespoons of oil in the pan. Thank you Art for a wonderful night! My kitchen definitely feels a bit hipper. Mix together dry ingredients – salt, baking powder, flour and corn meal – in a large bowl. Mix together wet ingredients – eggs, 1 cup buttermilk, butter and honey – in a second bowl. Purée one cup of corn in a food processor and add to wet ingredients along with cheddar cheese. Stir the remaining corn into the dry ingredients. Heat 2 tbs olive oil in a 12” skillet and fry batter in 1/4 cup cakes. When solid enough, flip cakes and serve with syrup, fresh berries or salsa. *Baking may be an exact science, but recipes aren’t. The moisture level of your dry ingredients can change the amount of liquid you need to add. The size of your eggs and the moisture in the corn will affect how much buttermilk you need. Don’t be afraid to play around with the amounts listed above, one tablespoon at a time. High as an elephant’s eye. My Dad did his PhD thesis on corn. At night my Mom typed out page after page, over 100, on a typewriter. Corn expertise was highly regarded in our home. 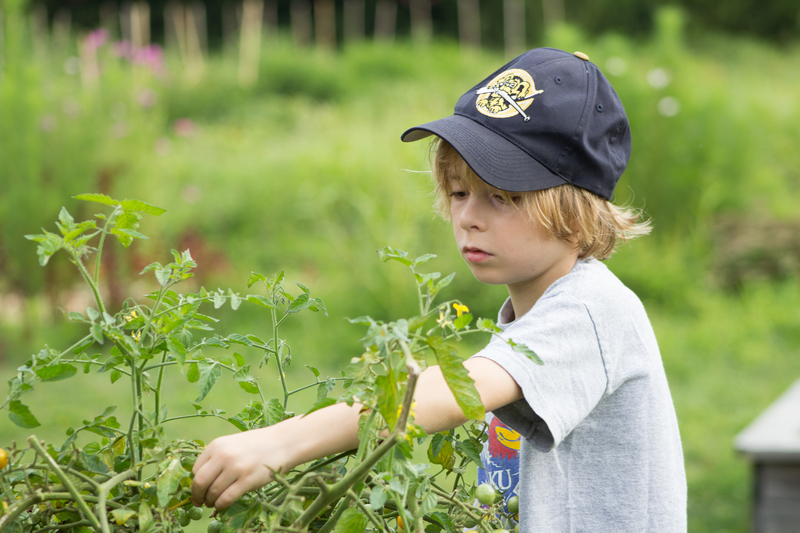 Dad taught us that all vegetables have sugars which, once harvested, convert to starch. This happens faster in some vegetables than others. Corn is one of the fastest. As a kid, when corn was on the dinner menu, Dad and I would stop by Sapowsky’s on the way home and wait in their dirt driveway, outside the farm stand, for the next cartload of corn to come in from the fields. We would grab a dozen and head home, where Mom already had water boiling. As soon as we pulled into the driveway I would get out, shuck the corn, Mom would boil it for a couple of minutes and we would eat it, hot and fresh, usually without any butter or salt. 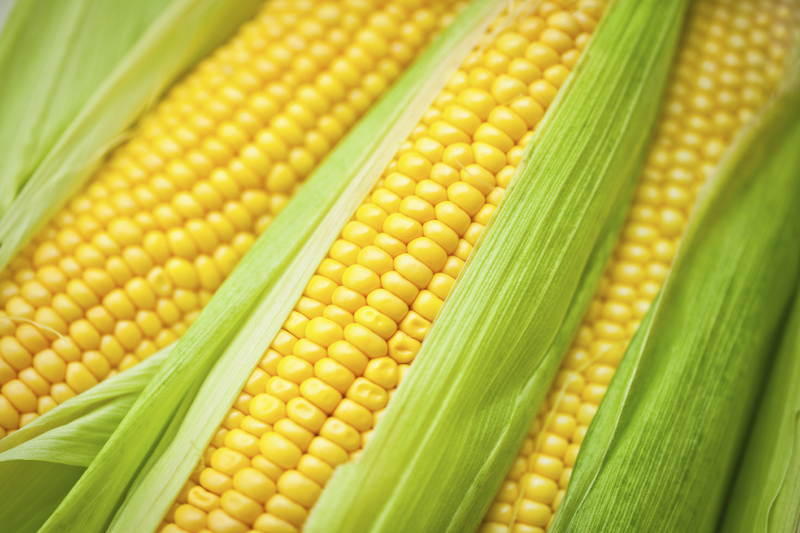 Today’s cultivars of corn have more stable sugars, but corn is still best picked during the cool hours of the morning, quickly refrigerated and eaten as soon as possible. 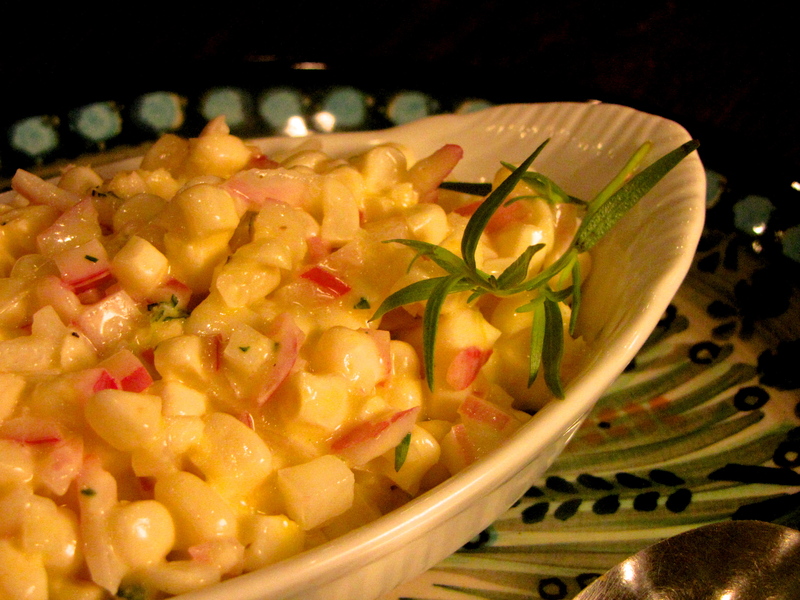 These salads celebrate the light, sugary sweetness of raw corn and should be made with the freshest corn you can find. This Southwest salad is just dying to be served over carnitas tacos! The Herbed Goat Cheese version is a perfect, light summer picnic salad. Serve it alongside herb and wine poached chicken and a perfect loaf of crusty country bread slathered in farm-fresh butter. Just a thought. 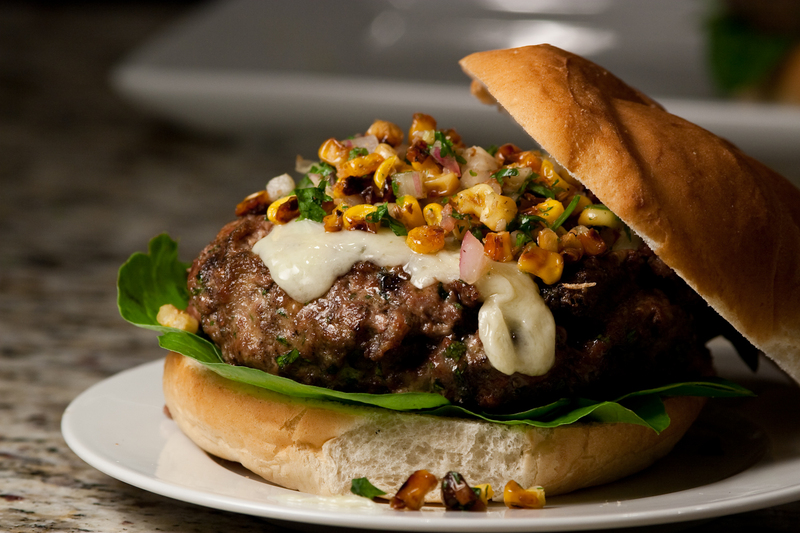 Slice the kernels from the corn, mix with the red onion and toss with one of the following dressings. *Red Merken is a spicy chili oil with nice depth. Substitute another chili oil or order online from Sapore. Mash garlic into a paste with coarse salt. Stir together cheese, garlic paste, basil, lime juice and cumin. Whisk in Red Merken Chili Oil. Lightly dress corn and onions. *The Champagne Mimosa Vinegar is light with a hint of fruit. Substitute any light white wine vinegar. Mission olive oil is light and grassy. They can both be ordered online from Sapore. 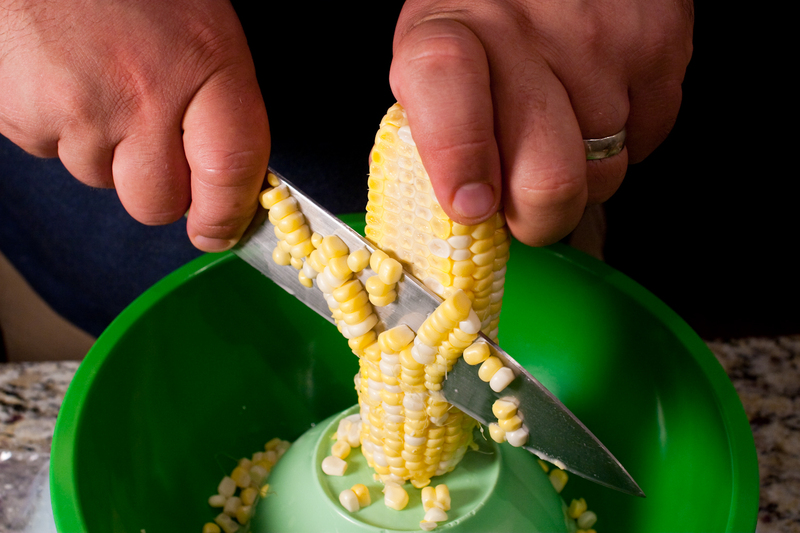 Slice kernels from the corn. Toss with onion in a medium bowl. Stir together cheese, garlic paste, tarragon, lemon juice and Champagne Mimosa Vinegar. Whisk in Mission Olive Oil. Alice Waters, this combination is divine. Practice your knife skills. 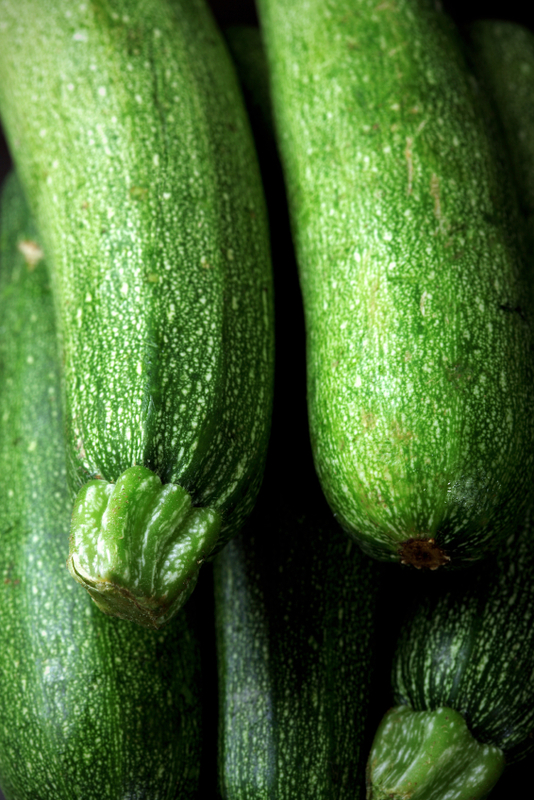 Cut the zucchini down into a 1/4″ dice, approximately the same size as the corn kernels. Fresh pasta isn’t just un-dried. Fresh pasta is traditionally made with eggs and soft wheat “00” flour while dried pasta is made with just hard durum wheat and water. An easy rule of thumb is to use fresh pasta for light dishes and cream sauces. Dried pasta is your choice for heartier sauces like Bolognese and Carbonara. Large pasta is tough to mix with small ingredients. When tossing the corn and zucchini with the fresh fettucini that Alice recommends, you end up with all the veggies in the bottom of the bowl. Orzo is easier to mix through. Butter is a condiment. Add it at the end. Don’t even think of leaving it out. It adds a necessary richness. This tastes just as good hot as it does as a cold pasta salad. Bring a 4 qt pot of water to a boil and salt heavily, 2 tbs. Heat olive oil in a 12” sauté pan over medium heat. Add onion and cook until softened. Add garlic and jalapeño and cook 30 seconds until fragrant. Turn up heat to medium high and add zucchini. When you add the zucchini to the pan, add the pasta to boiling water. When zucchini is softened but firm add corn and cook 1 minute. When pasta is still undercooked – firm in the center, strain it, reserving 1 cup cooking liquid. Add pasta and liquid to vegetables. Cook until water has evaporated. Add cilantro and butter. Season to taste with vinegar, salt and pepper.